Caneel Bay Rosewood Resort occupies a magnificent 170-acre peninsula that has to be one of the most idyllic and picturesque spots in the world. In a class by itself, it seems as close to paradise as one can come on earth, and yet, it may not be everyone’s cup of tea. If there is a need for glitzy night clubs or the routine of television and telephones, Caneel Bay is lost in another era. It lies in semi-slumber in total harmony with the tranquil, unspoiled beauty of uncommercialized St. John, the National Park Island of the U.S. Virgin Islands. Caneel’s modern ferry boat churns the lapis water into pure white foam on the 40-minute ride from St. Thomas. You sip complimentary champagne as the truly “virgin” island of St. John draws closer and radiant colors of the flowers come into view. As you step from the boat, you are surrounded by poinsettia, hibiscus and bougainvillea together with coconut palms and African tulip trees, their colors bursting into one great welcoming bouquet. The ferry drops guests within a few feet of the lobby veranda where a hostess welcomes you with a brief orientation and escorts you to your room. Guest rooms are situated in discreet, low-profile clusters situated for privacy, and all opening directly on to one of the seven dreamlike, white powdery beaches. Cottages are built in the rich wood of the region with plantation fans, hand-woven fabrics, and simple elegant furnishings under high cathedral ceilings forming a very inviting décor. Bathrooms are spacious and well-equipped with all the extra amenities including Caneel’s own formula of moisturizers and suntan lotion. Each room has a welcoming bottle of the famous Virgin Island’s Cruzan Rum. The seven beaches of Caneel range from long strands of white sand to pocket coves where it seems no one has been before. The waters are so pristine you can see your shadow on the sea floor. There are many activities to pursue at every hour of the day including diving, snorkeling sailing and hiking. If you run out of reading material there is a little library near the office with an interesting selection of paperbacks. An eleven-court tennis park on the estate attracts tennis enthusiasts either early in the morning or at night when the sun goes down. To absorb and connect with the serenity of Caneel, take a stroll through the tropical gardens under sugar, date and coconut palms with lush green hills in the background and wonderful fragrances drifting on soft trade winds. Caneel Bay Resort has three restaurants which have contributed to the resort’s reputation as a gourmand’s fantasy in a world class setting The elegant Turtle Bay Estate House is the more formal of the three, where guests can enjoy a classic menu with a lot of originality in a beautifully appointed dining-room This is the place to celebrate the joie de vivre with service and presentation that is both efficient and personable, and guests are treated to Caribbean style warmth, touched with humor. Afternoon tea and evening cocktails are served on the verandah. A welcoming cocktail party hosted by congenial resort manager, Nikolay Hotze, provides guests an opportunity to meet and share stories. It was surprising to meet other guests from Washington DC -- a family of three generations with a beautiful two month-old baby girl. Breakfast and lunch buffets are also served on this lovely verandah in high season. The Estate House has its own climate controlled wine room with an impressive collection of over 10,000 bottles. The Beach Terrace, situated along the ocean front, is fabulous for casual dining serving both breakfast and lunch. Here there is an endless buffet where every item you could possibly desire on a Caribbean menu is available -- fresh fruit, tantalizing desserts and luscious chocolate concoctions. Keeping in mind that all meals at Caneel Bay are prepared with health and fitness in mind, one feels free to indulge! In the evening the Equator Restaurant, the old 18th century Sugar Mill, offers a wonderful setting lit only by candles and moonlight, and filled with the tantalizing aroma of charbroiled steak and lobster. Finding a table near the outer wall of the mill, with its expansive view across the water all the way to the lights of the island of St. Thomas, is finding the perfect environment to enjoy a romantic dinner in the most tranquil setting. Absorbing the beauty of Caneel without television or telephone, under turquoise, pollution-free skies, leaves little doubt as to why so many celebreties, including Presidents and movie stars, have made it their island retreat. It simply becomes an ongoing romance with Nature. 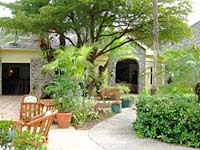 Managed by Rosewood Resorts since 1993, the property was first opened in the 1930’s by the West Indian Co. Limited. In 1952 Laurence Rockefeller purchased the small resort development and donated it to Jackson Hole Preserve, Inc. This nonprofit, conservation organization was founded and supported by the Rockefeller family. Rockresorts Inc. managed the resort and all profits were devoted to maintenance, operation and improvement of the hotel and to furthering Jackson Hole Preserve’s other conservation activities. The Rockefellers also recognized the supreme eligibility of the beautiful, unspoiled island of St. John as a National Park, and purchased more than 5,000 acres, over half the island. This property was donated to the federal government, and legislation creating the U.S. Virgin Islands National park was enacted in 1956. The park has remained a sanctuary in which wildlife, natural beauty and historical sights are preserved. Caneel Bay offers the Modified American Plan (MAP) which includes breakfast, lunch and dinner. Plans are 50% off for children 5 to 12 years old, and there is no charge for children 4 and under. For more information, please call 340-776-6111 or e-mail caneel@rosewoodhotels.com. For reservations call 888-ROSEWOOD.